It's pretty rare for me to buy new jeans although recently I've actually bought quite a few new pairs - some I've kept, some I've returned. Buying jeans is so tricky and honestly, once you find a pair that are the perfect fit for you then don't let go! With that said, I'm always up for trying something new, I'm always shopping and so newbies are inevitable (even if I think I've found my perfect pair). I used to absolutely love the Topshop leigh jeans, they were the only style I wore and I had them in many different shades of denim and even some funky colourways too - I just loved them that much! As my style began to change and trends developed I fell out of love with skinny jeans and the leigh jeans took a backseat (I'm not sure I have any in my denim collection anymore!) which is when I fell for the ASOS Farleigh jeans, around 3 years ago I think, and they've been my favourites ever since. The Farleigh's are a 'high waisted slim mom jean' as per their description on ASOS but I've had countless people tell me they aren't mom jeans because of how they fit but if ASOS says they are then they are. I've found they fit perfectly around my waist, which is considerably smaller than my hips and thighs, without being too tight over the rest of my legs. More recently in my denim collection, I've introduced the Topshop 'Orson' jeans. I think these are a very similar fit to the Farleigh's but they're more pricey! With approximately 5 pairs of Farleigh's now in my collection, it's safe to say I don't need any more jeans. But, I bought some. These jeans are from New Look and really affordable so of course I wanted to try them out for myself and see how well they fared compared to other styles I've tried in the past and my current collection. These are the 'Tori' jeans, again, they're described as a mom fit so I thought they could be a a pretty good match for the Farleigh's, which are so often sold out online, and these could be a more inexpensive alternative too! I'm still umming and ahhing over these jeans, overall I like them but I know they're not the greatest fit on me. I usually size down in anything high waisted but not so much in my jeans however, I bought these in both a size 6 and 8 and I found the smaller size fit much better around my waist. With that said, after some wear they have definitely stretched out and are now a bit too loose around my waist. I think they look fine when I tuck in a jumper (which, let's be honest, isn't going to be an issue as I tuck in everything) but post-winter I'm not sure I'll still get much wear out of these. These jeans start at a size 4 which I usually find is a good indicator to dictate sizing - if it starts with a size 4, more often than not it means you can afford to size down. So I bagged another pair a few days ago, this time in a size 4 and we'll see how those do (I don't own anything in a size 4 so this is most definitely a first for me!) - only once my capsule wardrobe is finished of course! So let's talk a bit about the rest of the look - I have so many images in this blog post that I need a few more things to talk about other than just my jeans! 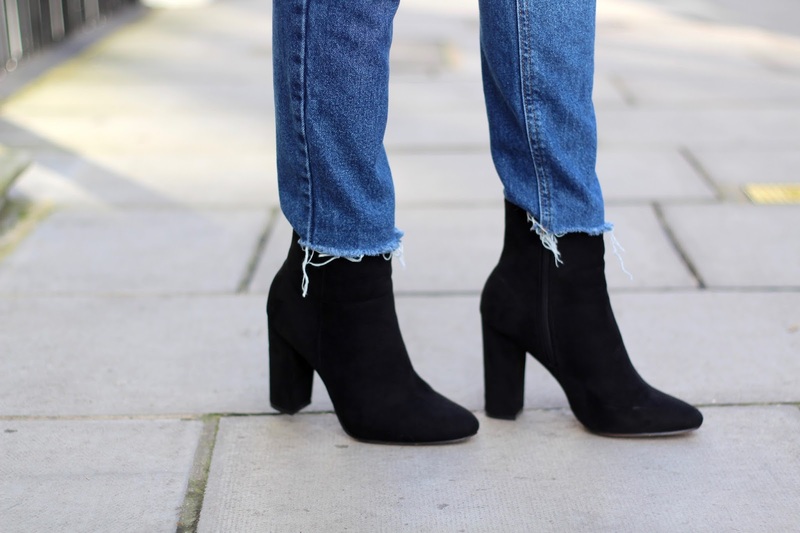 Starting with these suede ankle boots, the best thing I could have included in my capsule wardrobe I think. I've been brainstorming a few ideas for upcoming videos and basically rounding off my January style challenge and these boots have ranked pretty highly. I've had these in suede burgundy in the past (which I wore to one of my favourite ever London Fashion Week seasons a few years ago) and I've also got the leather black ankle boots version too. I also wore a black bodysuit from Missguided which has been ideal to either dress up or dress down, my faux fur coat from Monsoon which I jut absolutely love and I think will be a wardrobe stable of mine for a really long time! I also added a black belt from River Island (as I mentioned previously, with a figure hugging top I need to add a belt now that these jeans have began to stretch out). I just love this look, I think everything ties together so effortlessly and I'm into that.